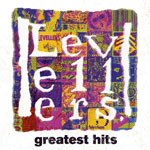 Share the post "Album review: LEVELLERS – Greatest Hits"
This greatest hits collection collects every one of the Levellers singles from the past twenty five years, of which twenty were hit singles. There is also an accompanying DVD which features some weird and wonderful videos, plus a hard hitting one for ‘The Recruiting Sergeant’. The Levellers have made a very successful career under the mainstream musical radar gaining a large and loyal fan base, plus running their own annual festival. In many ways a natural heir to Fairport Convention in that both release music on their own record labels, host their own festivals and have a ‘hands on’ approach to the business side and connecting with their fans. Fans will doubtless have the hits on here like ‘One Way’, ‘Beautiful Day, ‘Hope Street’ et al, however there are four newly recorded songs that will be of interest. Each has the band backing various guest musicians with ‘Julie’ featuring Frank Turner, a fan of the band and one of his musical inspirations and Imelda May has great fun on ‘Beautiful Day’. Billy Bragg makes ‘Hope Street’ sound like one of his songs with a big change in the tempo of the song compared to the original version. Finally Bellowhead have fun on ‘Just The One’, a song made for them as it features drinking! All four guests are featured on the DVD too. This entry was posted in ALBUM REVIEWS, ALBUM REVIEWS (Mobile), All Posts and tagged album, Bellowhead, Billy Bragg, folk rock, Frank Turner, Greatest Hits, Imelda May, Levellers, review. Bookmark the permalink.